Western Bottle News: Western Curved "R's" ? RARE possibly Unique & PERFECT MINT! Backwards 2 too! Note the very curvy legged Western Style "R" in BOGARDUS here! 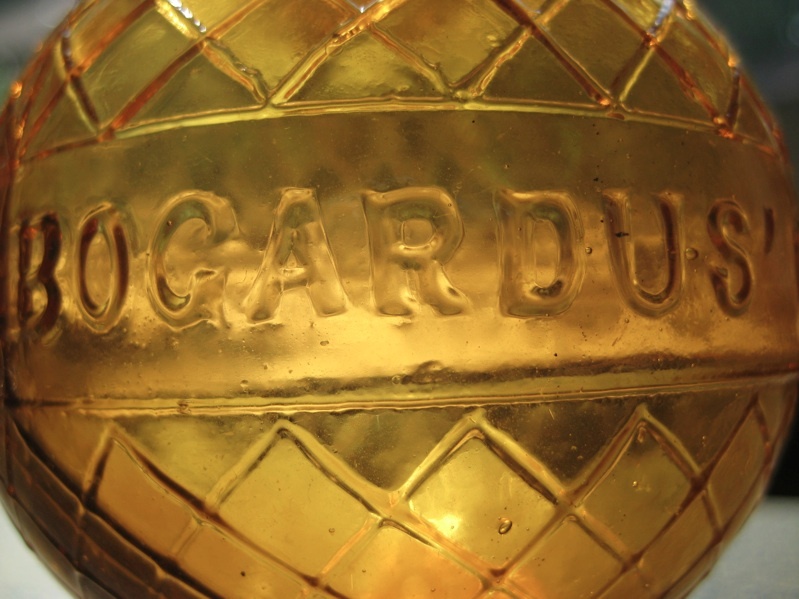 The one for sale in this auction is embossed "BOGARDUS' GLASS BALL - PAT'D APRL' 10 1877" (in the center band), and it also has a backwards number "2" in a diamond above the center band and the number "2" (not backwards this time) is embossed on the base. The backwards "2" and the number "2" on the bottom makes this a very scarce to rare (and very cool) variant, but with the curved "R's" too, it may quite possibly be unique! 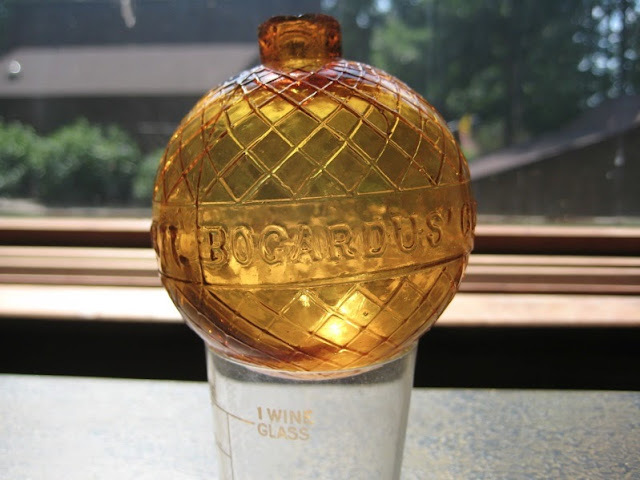 Quoting Mike McKillop, who writes on the Peachridge Glass website as follows "I believe that the 1870′s was the golden age of western glass making, and nothing shows that better than western curved R bottles. 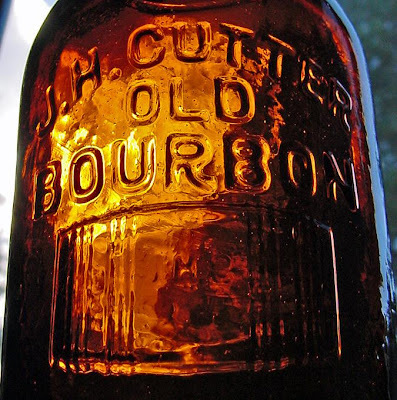 Curved R bottles were only made at the S.F. & Pacific Glass Works, when C. Newman owned the company during the 1870′s. No other glass company used that style of R in their molds." (There is some speculation amongst the Western glass collectors that we've talked to that this style of R, with the curved front leg, is the work of one particular gifted mold maker. Glass with the embossed curved R's of his may have been his signature, effectively saying, "I made this!") 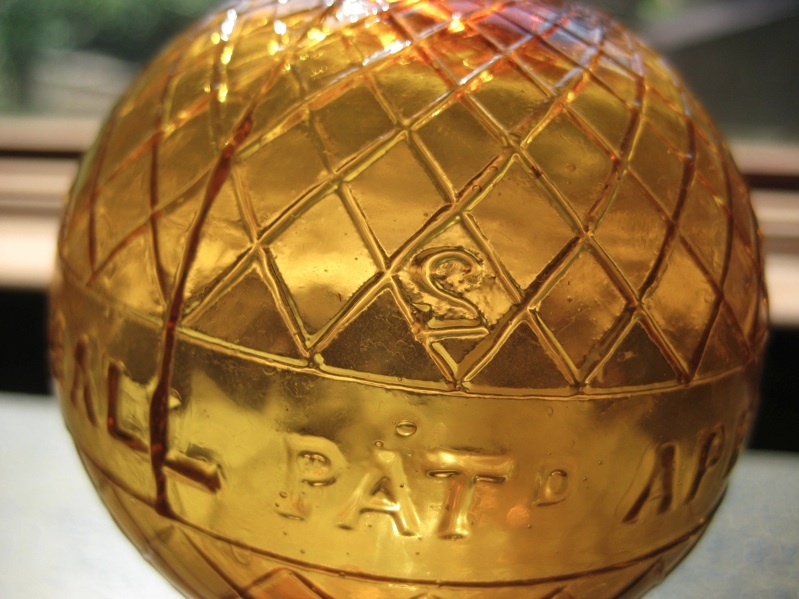 Warren Friedrich, author of the fantastic book "Early Glassworks of California" writes on that same site, "Glass target Balls were manufactured by at least two of the West Coast glass works, San Francisco Glass Works and the California Glass Works." With those two pieces of information, the noted reliability and expertise of the Peachridge Glass website, and additional information from our copy of Friedrich's book (see photos & captions below), we feel confident that this Bogardus glass ball was very likely produced at the San Francisco & Pacific Glass works. The Bogardus design was closely followed, with the exception of the curved R's, the signature mark of that mold maker, we believe! Sure seems like there are a lot of Western "R's" popping up lately! The target ball has a variation of a "curved R", but certainly not the one and only Western R. Also not the font of the other letter, very unwestern looking to me. Yeah, this is a classic pump and dump.......its currently for sale on eBay !